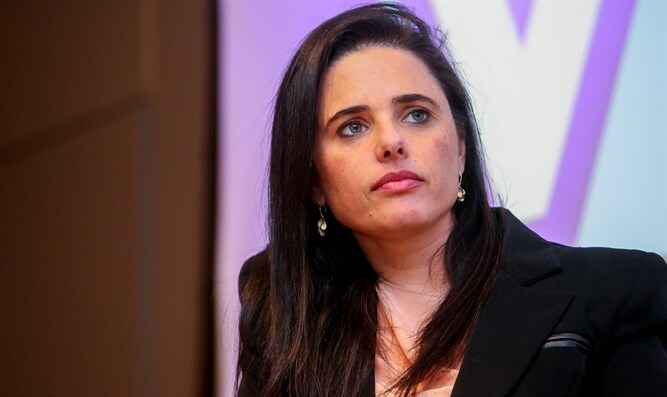 Justice Minister Ayelet Shaked is frustrated by the security response to the rocket fire at the Sharon region on Monday morning, which resulted in seven people being injured. "This is a very serious security incident. Hamas is simply not afraid of us. The very fact that there are missiles aimed at the entire State of Israel without hindrance is something we must not accept," Shaked told Arutz Sheva. "Since we did not respond firmly to the kites and the balloons that were fired at the communities surrounding the Gaza Strip, the situation has deteriorated to missiles on Tel Aviv and the Sharon. Minister Naftali Bennett has had a very consistent position for years that we need to stop being afraid and stop containing and sanctify the perception of the tie, but rather dare and win. The Israel Defense Forces is one of the strongest and most talented armies in the world. We can deter Hamas. It is only a matter of making the decision to do so. We have to decide that this is what we are doing. We have a lot of means. There is no need to bring soldiers into Gaza because the army has enough plans and possibilities to strike Hamas very hard without bringing in soldiers." Minister Shaked said that Minister Bennett, should he be appointed Defense Minister, will lead a different policy than that of Prime Minister Binyamin Netanyahu. "We disagree on the general approach. We must not contain and pay Hamas protection money. They have to be afraid of us. They have to be deterred and we should not allow this rampage to happen. We have to understand that firing at the Gaza envelope is just like firing at Tel Aviv and the Sharon. We do not have to wait for rockets to fall on Tel Aviv in order to deal with Hamas. " Feiglin, she opined, will bring a political disaster upon the State of Israel. “There are clear leftists in his party. And I say to those who plan to vote for Zehut, that it is true that Feiglin himself is a man of the Land of Israel, but his party includes leftists from the Labor Party and the Green Leaf party. We already had a similar experience with Raful (former IDF Chief of Staff Rafael Eitan who later became an MK with the Tzomet party -ed. ), who brought with him leftists who later transferred the Oslo Accords."